*All vehicles subject to prior sale. Plus tax, tag, and title with approved credit. All advertised prices exclude government fees and taxes, any finance charges, any dealer documentation preparation charge, any electronic filing charges and any emission testing charge. Venice Honda in Florida has the Honda finance offers Sarasota, Port Charlotte and Venice, FL, drivers have been waiting for. Our Finance Department proudly offers affordable and competitive financing options and great rates on new Honda models such as the stylish Honda Civic, glamorous Accord, versatile CR-V and reliable HR-V. Be sure to take advantage of these special finance offers while they last! Even for those who've encountered financial challenges, at Venice Honda, we believe everyone deserves the opportunity to purchase a vehicle, and we're always working hard to provide Honda finance options for drivers around Osprey, Englewood and North Port, FL. If you think your credit history is holding you back from owning your dream Honda, we can help get you the credit you deserve. We even have first-time-buyers programs for those who currently don't have established credit. At Venice Honda, both recent college graduates and military members can receive discounts on their new Honda. Our Honda Graduate Program is designed to help upcoming and recent grads save on their new Honda when they finance or lease with Honda Financial Services. In appreciation of their military service, we also proudly offer U.S. Military individuals and their spouses $500 toward a new Honda model. Ready to get behind the wheel of the Honda you've been dreaming of? Fill out our online credit application now and get approved right from your own home instantly! 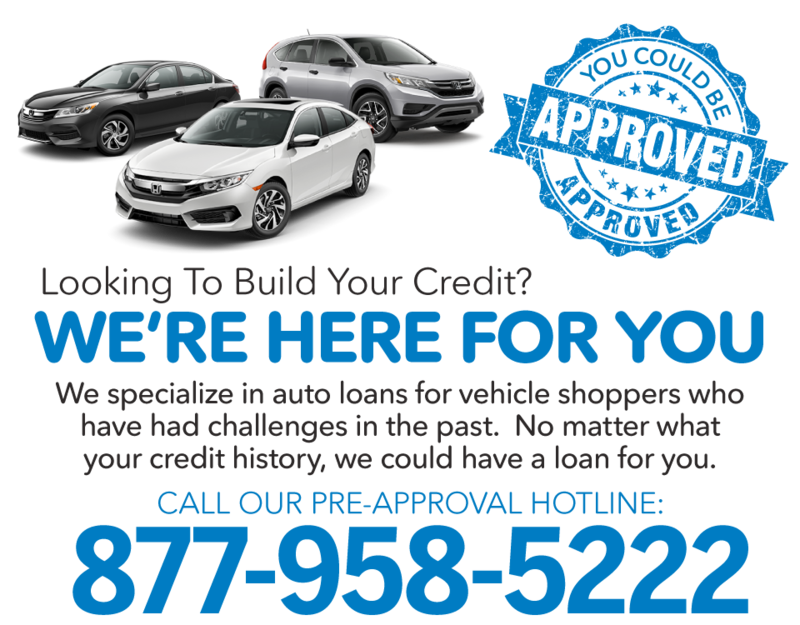 When it comes to financing your new or used Honda, at Venice Honda in Florida, we take it upon ourselves to get you the fair and affordable Honda financing deal you deserve. By checking this box, I opt-in and agree to receive text messages from Venice Honda. Message and data rates may apply.